The 8th Ministerial Meeting of the China-Arab States Cooperation Forum will be held in Beijing on July 10. President Xi Jinping will attend the opening ceremony and deliver an important speech. 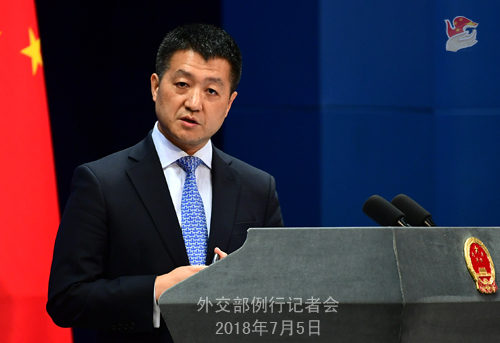 At 9 o'clock tomorrow morning, the Ministry of Foreign Affairs will hold a press briefing at Lanting, during which a senior official of the Foreign Ministry will brief you on President Xi Jinping's attendance at the opening ceremony of the 8th Ministerial Meeting of the China-Arab States Cooperation Forum and take your questions. We welcome your participation. Q: Firstly, US Secretary of State Mike Pompeo will discuss the issue of nuclear weapons when visiting the DPRK. What is your response? Secondly, regarding the China-US trade issue, the Spokesperson of China's Commerce Ministry has elaborated on it this morning. Before the official imposition of additional tariffs on each other, what message would China send to the US? A: With regard to Secretary of State Mike Pompeo's visit to the DPRK, we are glad to see that the DPRK and the US can step up contacts and negotiations, meet each other halfway and demonstrate goodwill towards each other, follow through on the consensus reached at the DPRK-US summit in Singapore on June 12, and further promote the denuclearization process of the Korean Peninsula and the establishment of the peace regime on the Peninsula. We would be glad to see the positive outcomes reached by the two sides through direct contacts and dialogue. 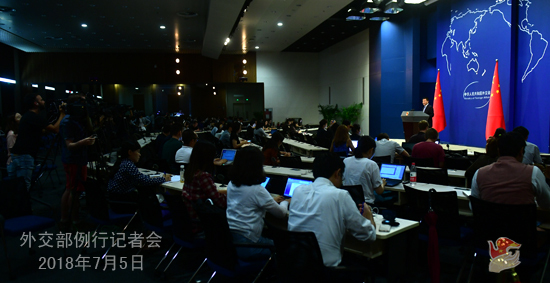 Regarding the China-US trade frictions, the Spokesperson of the Commerce Ministry has elaborated on it this morning and made clear China's position. His responses are authoritative and I do not know what else you would like to know. Follow-up: Up to now neither China nor the US has officially imposed the proposed tariffs. Will China take relevant measures or talk with the US at this point? Reports say that China will join hands with the EU to fight back against the US, so how is that going now? A: I believe a trade war is the last thing we want to see, not only for China, but also for American consumers and business communities, as well as all other economies and people of all countries in the world. A trade war serves no country's interests and will only end up undermining the interests of the industrial and business communities and consumers of all countries. This is what we had said long before, and we surely don't want to see the outbreak of a trade war. However, for any country whose legitimate interests are hurt, it indeed has the rights to firmly safeguard its own interests. This is beyond doubt. You also asked whether China remains in contact with the US on this issue. I could tell you responsibly that the US knows perfectly well China's position. As to how the negotiation goes between China and the EU or other countries, you may have noted that Premier Li Keqiang had a telephone conversation with President of the European Commission Jean-Claude Juncker at request yesterday. Leaders of the two sides said that under the current circumstances, all countries should stand together against unilateralism and trade protectionism and safeguard the rules-based multilateral trading system. Q: There have been reports that there is essentially no communication between China and the US on trade at the moment. We are wondering why China has not made more efforts to try and contact the US side? Or if you have, but the US is refusing to talk? A: As two major countries, China and the US maintain normal communication and exchanges. This is out of question. As to the trade friction you are following and how to avoid escalation of trade dispute, like I just said, the US knows perfectly well China's stance. I shall stress that it is not the Chinese side that triggers this dispute or even possibly tries to escalate the dispute into a trade war. We have made clear our position at the very beginning, and our position remains unchanged till now. You must be all very clear about this. Q: It is reported that Japanese Prime Minister Shinzo Abe plans to visit China as early as in October this year and hold talks with President Xi Jinping. What is your comment? A: The Chinese side has invited Prime Minister Shinzo Abe to visit China at a convenient time for both sides. We hope that our two sides can make concerted efforts to create an enabling atmosphere for it. Follow-up: Besides attending the China-Japan-ROK Summit, Prime Minister Shinzo Abe will pay a visit to China separately. What is your comment? A: The diplomatic departments of China and Japan maintain communications. Like I said just now, we hope that our two sides can make concerted efforts to create an enabling atmosphere for it. Q: India's flag carrier airline Air India has decided to change the reference of "Taiwan" into "Chinese Taipei" on its website. Two months ago China's civil aviation authority sent a formal communication to several airlines, including the Indian one. What is your comment on this? Did the Chinese Foreign Ministry also raise the matter with India? A: The Chinese government's position on this issue cannot be more clear-cut, and India and other countries around the world are quite clear about it. By taking the relevant step, Air India shows respect for the objective fact that there is only one China in the world and Taiwan is part of China, which is also the common sense and international consensus. 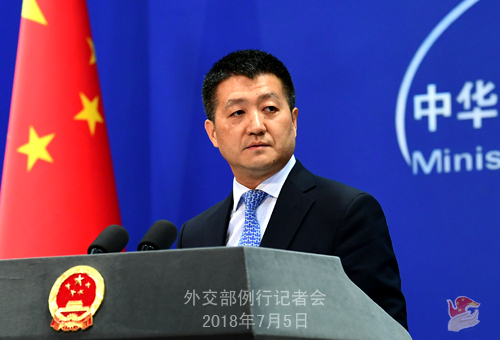 I want to stress once again that it is the basic requirement for any foreign enterprise operating in China to respect China's sovereignty and territorial integrity, abide by China's laws and respect the national feelings of the Chinese people.